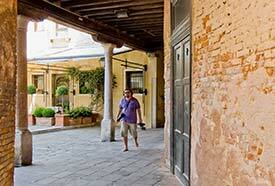 ABOVE: The Hotel Ai Due Fanali's entrance is on the Campo San Simeon Grande, behind the passing tourist. INSET BELOW: Breakfast on the roof terrace, and another view of the hotel. Location: On the Campo San Simeon Grande, a few minutes on foot from the railroad station and the Piazzale Roma. You want a quiet, romantic, moderately-priced hotel on a pretty little campo away from the hustle and bustle of the tourist areas, but you don't want to walk very far from the train station, the airport bus, or transportation to the cruise port. The Ai Due Fanali is on the same square as two four-star boutique hotels, the Hotel Canal Grande and the Ca' Nigra Lagoon Resort. At night, you'll enjoy going outside the hotel and walking to the edge of the Grand Canal, where you can sit on a park bench and watch the passing boat traffic. And in the morning, you can enjoy breakfast in the hotel's top-floor breakfast room or (in good weather) on the roof terrace. from the railroad station or the Piazzale Roma, see our in-depth Hotel Ai Due Fanali review. The top photo shows the train station on the left, the Scalzi Bridge over the Grand Canal, and (toward the right) the Campo San Simeon Grande, which opens onto the Grand Canal between various palazzi and other buildings. In the second photo, you can see the Hotel Ai Due Fanali in the right-hand corner of the Campo San Simeon Profeta (another name for the Campo San Simeon Grande). The hotel entrance is under the awnings, and many guest rooms are in the adjoining building that connects with the church tower.